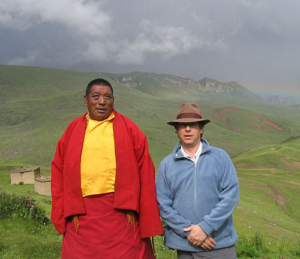 Surmang Khenpo with Mark and Larry at work. 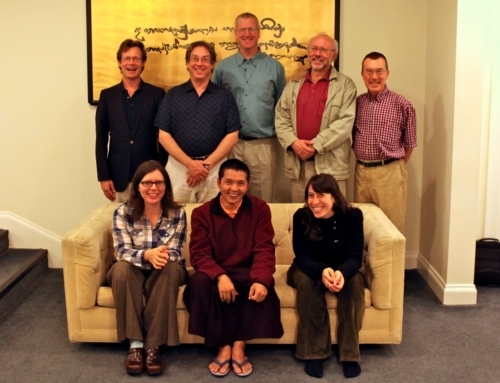 Last fall (2006), we were very happy to welcome Surmang Khenpo from Surmang back to Halifax. He arrived in late November to have a medical procedure done, which was successful, though it took much longer than anyone expected. Khenpo stayed with us for two months and, while waiting for numerous medical tests and decisions to be made, we worked a great deal on translating new material from the Vidyadhara’s collected writings from Tibet. In preparation for the summer, we worked on finishing the texts needed for the abhisheka of the Vidyadhara’s Avalokiteshvara terma. We began work on another cycle of the Vidyadhara’s terma known as the Profound Heart-Essence, which includes a root sadhana, various related liturgies and songs, and a guru yoga for Nyak Jnanakumara (one of Padmasambhava’s close disciples, who the Vidyadhara-as-tertön was previously.) We also worked on a Krodhikali (black Vajrayogini) sadhana, as well as a volume of supplications, spontaneous songs, and oral instructions. As always, Khenpo’s energy and humor made our work together a delightful feast of dharma and language. Karma Senge Rinpoche and Jessie Litven. In early May, Karma Senge Rinpoche settled into comfortable quarters at the home of Steve Brooks, who very generously allowed his house to become action-central for our work with Rinpoche. 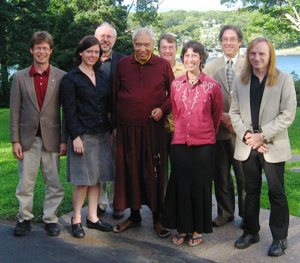 Jessie Litven moved in as resident translator and Tibetan secretary to Rinpoche; Malone Sinclaire was the overall coordinator, supervising a fabulous crew of cooks and other volunteers over a two-month period. Karma Senge Rinpoche bestows the Avalokiteshvara abhisheka. Rinpoche quickly dove into the work at hand, preparing for the Avalokiteshvara abhisheka, which was certainly the highlight of his visit for the many participants, and for us too. But something else happened that was quite remarkable. We found ourselves in the midst of a translation and publishing factory, meeting together almost every day to review our translations and assist Karma Senge Rinpoche in his compiling and publishing in Tibetan some of the many liturgies composed or discovered by the Vidyadhara, properly assembling them for use both by us and by monastics and retreatants under his guidance in Tibet. 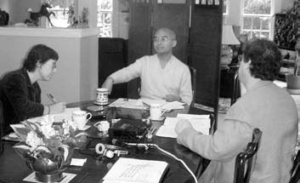 Rinpoche was clearly excited to employ our computer technology, and he worked continuously (both in and out of translation meetings) to edit, assemble, and proofread these Tibetan compilations, with Jessie by his side to execute his instructions. As on his previous visits, he brought several “new” (to us) texts by the Vidyadhara and many older editions of works he had already given us. Karma Senge Rinpoche with Jessie on computer. A plan for future transmissions of the Vidyadhara’s termas also emerged, including instructions for a special ngöndro to prepare students who wish to focus on this cycle of teachings. We hope that Rinpoche will be able to travel extensively in the U.S. on his visit to the West next year, conferring the ati practice of Avalokiteshvara there, unfortunately not possible this year due to visa problems. We are working now on the next major transmissions, the first of which will hopefully occur in Halifax next year: a Krodhikali (Tröma Nagmo) Sadhana of black Vajrayogini that incorporates a lengthy chöand short phowa practice; and the Profound Heart-Essencecycle for a later visit. Rinpoche was able to compile both of these in Tibetan during his time with us, as well as several other texts. He also conferred the Avalokiteshvara abhisheka on the Sakyong and gave him the transmission for a magnetizing practice of Chakrasamvara written by the Vidyadhara. We were again very fortunate to be joined in our work by Lama Ngodup Dorji from Bhutan, who was very helpful with both oral and textual translation. Lama Ngodup was unable to remain for the whole visit, which gave Jessie, our budding oral interpreter, some serious practice time—as sole translator for his last three weeks in the province. Karma Senge Rinpoche spent a week at Gampo Abbey, his first visit there (enjoyed enormously by all), as well as conducting weekend abhisheka programs in Toronto and Vancouver, hastily assembled by many hard-working volunteers to great success. We are very thankful to all the many people who helped with this two-month visit. Yongey Mingyur Rinpoche meets with the Translation Committee. 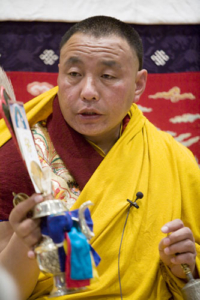 In July, during Yongey Mingyur Rinpoche’s teaching visit to Halifax, we were able to meet with him one morning, and he was extremely helpful in clarifying a number of subtle points of translation and dharma. His Eminence Namkha Drimed Rinpoche with NTC members and Peter Roberts. 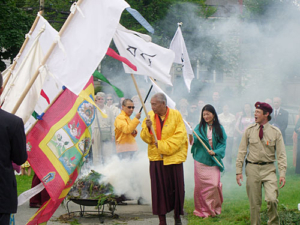 In August, we published our initial translation of the Vidyadhara’s Gesar Offering,The Ocean of the Play of Enlightened Activity: A Daily Offering to Warrior Gesar, Great Being Töndrup, King of Werma, Tamer of Enemies, in time for the Kalapa Festival here in Halifax. So soon after the passing of Robin Kornman, we feel honored to able to complete the work of this translation begun by him and dedicated to his memory. Just after the festival, we were able to meet with His Eminence Namkha Drimed Rinpoche to finish our translation of this practice that he had requested the Vidyadhara to write some fifty years ago in Tibet. Based on our meetings with him, we will compile and publish a practice commentary in the near future. Sakyong Mipham Rinpoche, Namkha Drimed Rinpoche, and Khandro Tseyang perform lhasang at the Kalapa Festival assisted by Mark. During this meeting, with the assistance of his daughters Semo Pede and Semo Palmo, and our good friend Dr. Peter Roberts, the Committee also completed a translation of a “Supplication for the Longevity of Sakyong Mipham Rinpoche” written at the request of Khandro Tseyang by His Eminence while he was leading a large group retreat at the Maratika Cave in Nepal with the Sakyong and Khandro Tseyang. 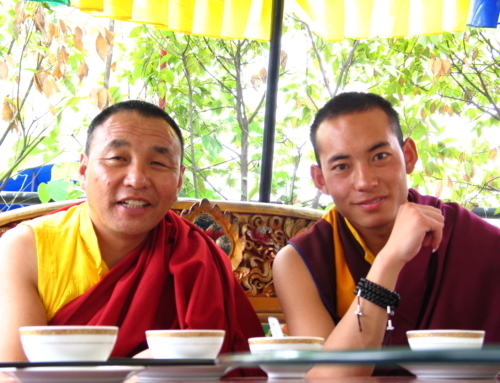 Damcho Tenphel Rinpoche and Larry in Kyere, Tibet. Other projects included completing a compilation of “Nyingma Lineage Supplications” and a “Supplication to Mipham Rinpoche” used at the Sakyong’s summer Dzogchen Retreat programs. Larry and Tingdzin taught the daily and feast practices of Avalokiteshvara to a large assembly of eager tantrikas during Karma Senge Rinpoche’s weekend programs: together in Halifax, Larry in Toronto, and Tingdzin in Vancouver. Larry also taught a winter program for tantrikas in Toronto, led a Chakrasamvara retreat at Sky Lake Lodge, and journeyed for the first time to Kham, East Tibet, with a small group sponsored by Shambhala Mountain Center, visiting Surmang and many of the home monasteries with which we have connections. Larry has been asked to assist with the first translation workshop conducted in Bhutan this fall at the Institute of Language and Cultural Studies. Tingdzin will teach inner Vajrayogini practice to three-year retreatants (Group F) at Söpa Chöling this fall. Scott taught on Mind and Its World, the views of the hinayana schools, and theUttaratantra at Nitartha Institute this summer. He continues to lead a weekly class on contemplative practice for sadhakas with Andy Karr and teach an intermediate Tibetan class. 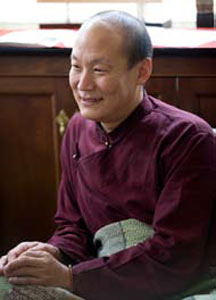 In December he will lead a two-week mahamudra retreat on Vancouver Island. Mark taught the Vidyadhara’s “Daily Offering to Warrior Gesar” to a large gathering of practitioners at the Kalapa Festival. 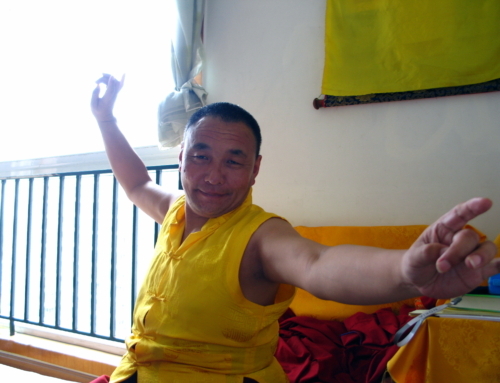 He continues to lead fire-offering programs at Dorje Denma Ling, as well as teaching Vajrayogini courses. Patricia will co-teach The Moon of Wisdom (chapter six of Chandrakirti’s Entering the Middle Way) with Tom Bell this fall. Jessie is returning to Asia this fall and winter for more study, training, and translation work. Enroute to Asia via Boulder, Jessie is continuing her work on translating the autobiography of the Sakyong’s mother, Lady Könchok Paldrön. She will journey to Surmang, Tibet, to visit and work with Karma Senge Rinpoche and Surmang Khenpo. Later, in India, Jessie will be teaching introductory Tibetan classes at Mingyur Rinpoche’s new Tergar Institute in Bodhgaya, as she has been doing in Halifax.